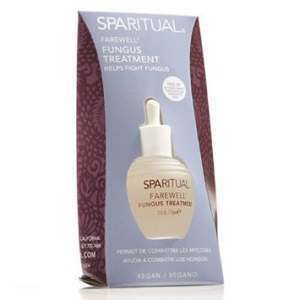 Sparitual Farewell Fungus Treatment is used to help prevent the spread of fungus and bacteria. Clean nails and surrounding areas with warm water and soap. Dry thoroughly. Apply a thin coat of solution to all nails and surrounding areas. Apply twice daily for best results. Farewell Fungus Treatment is $17 for a half ounce bottle. I found no mention of a Money-Back Guarantee for Sparitual Farewell Fungus Treatment. This product has no known side effects. You may experience redness and itching at application site. Sparitual Farewell Fungus Treatment is a topical solution used to help prevent the spread of fungus and bacteria. This product does NOT claim to clear fungus or bacteria. This is strictly a preventive treatment to help stop further spread of fungus. At $17 for a half ounce bottle, no money-back guarantee and no claim to heal fungus ridden areas, this may not be the go to product you are looking for. Jack Stevens	reviewed Sparitual Farewell	on November 30th	 and gave it a rating of 2.